Melbourne is known for its buzzing culture and hidden secrets. For an outsider travelling to Melbourne for the first time, this vast city can seem like a lot to take in. This is why it’s perfectly understandable to feel a little overwhelmed at first. However, Melbourne is the ‘Australia’s most liveable city’, and with a little guidance, you will be able to feel like a local in no time. Let us be your Melbourne Insider, so that you can experience the best that Melbourne has to offer. The ultimate Melbourne insider tip is to be prepared to be in the city with ‘four seasons in one day’. This is due to the changing weather conditions that can happen throughout the day. It can be 24 degrees and sunny one moment, and cloudy and raining the next. Even summer and winter can have unusually cold and warm days. Be prepared and pack some layers, including waterproof jackets. The Melbourne CBD offers free Wi-Fi to all visitors. Simply bring up your Wi-Fi settings on your phone and select VicFreeWifi. Just agree to the terms and conditions, and you’ll be on your way! Shopping centres such as Melbourne Central also offer free Wi-Fi. Holiday Inn Melbourne on Flinders also have free WiFi in all areas of the hotel for guests who are staying with us. A Myki pass is necessary if you want to travel around Melbourne. Every train station, and some of the tram stops and interchangeable bus stops, have a Myki vending machine where you can purchase a Myki. There are also some train stations, newsagents and 7-Elevens that sell Myki passes as well. You can purchase a top-up Myki, or weekly and monthly passes. Once you’re on your mode of transport, touch on your Myki by pressing it to the Myki reader. Remember to touch off when you get off at your destination. Melbourne has plenty of delicious and affordable options if you know where to look. 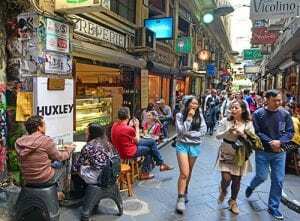 The CBD is full of secret laneways that have cosy and affordable cafes, bars and restaurants. Laneways include Degraves St, Collins Place, Tattersalls Lane, Hardware Lane and AC/DC Lane. There are plenty of cuisine options available for every culture. If you’re into Asian food, Don Don offers fast, cheap and delectable rice bowls. For lovers of Italian, Grossi Florentino offers affordable and yummy selections, and it’s open from 7:30am until midnight. Melbourne is also known for being one of the coffee capitals of the world. Our Melbourne Insider recommendations include Everyday Midtown, Brother Baba Budan, Market Lane Coffee in Therry Street and Axil Coffee Roasters. 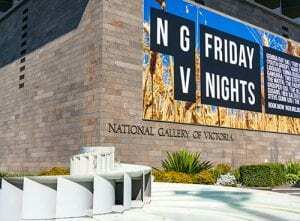 What makes Melbourne, and Victoria, so special is that there are so many amazing destinations and activities outside of the city. Take every opportunity you can get to explore outside the CBD. For those who want to keep it close, Collingwood is only a short tram ride north of the city. Highlights include a delicious selection of cafes and the Collingwood Children’s Farm! If you’re feeling a little more adventurous, head out east and spend the day in the Dandenong Ranges. 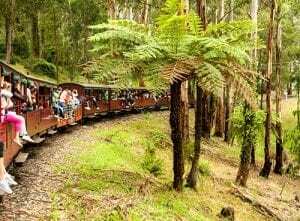 Go for a hike among the fauna and wildlife in the mountains, visit one of the more quiet and cosy cafes available, or hop on board and ride Puffing Billy, one of Victoria’s most treasured locomotives. South of Melbourne, visit Geelong to experience seaside restaurants and the thrills of Adventure Park, Victoria’s biggest waterpark. You can even head down the Great Ocean Road and pay a visit to the Twelve Apostles. The Royal Botanic Gardens’ Aboriginal Heritage Walk and I’m Free Walking Tours. Save up to 35% on stays until 30 June in the Melbourne CBD with our Here, There & Everywhere Sale. Sale ends 26 April 2019.